The frictional and compressibility/recovery properties of cork are utilized tremendously in this application. The cork clutch facings are used in light industrial machines and two wheelers. BCI supplies cork sheets as well as readymade cork rings/components which are used as clutch facing. We manufacture asbestos free clutch facings, automotive clutch facings in moulded and woven compositions. Noted for their stability, burst strength and anti-judder characteristics, these clutch facings maintain a medium co-efficient of friction to give smooth and stable performance. These facings possess excellent modules of elasticity and are non-aggressive to mating surfaces. We are offering Clutch Plate Clutch Facing to our clients. NAVENO Clutch lining is a brown colored solid friction material made from high grade asbestos cloth reinforced with brass with and bonding by superior grade of binder at high temperature and pressure. It has good resistance of temperature and pressure with medium Co-efficient of friction. It is also available in non metallic. Backed by the support of our talented professionals, we have been able to manufacture a qualitative gamut of Industrial Clutch Facing. - Used to install in power transmission system of cars, trucks, tractors, etc. Kadambari Auto Parts Pvt. Ltd.
We offer high quality of Clutch Facings. With a firm commitment to quality, we are involved in offering a wide ambit of Automotive Clutch Facing. NOTE:- All manufacturers Name, Numbers , Symbols and Descriptions are used for reference purpose only and do not imply that any part listed is the product of these manufacturers. MACAS is one of the leading manufacturers and suppliers of High Quality Asbestos Free Clutch Facings for OEM and After market requirements.We produce facings upto a Dia 500 mm.We produce facings for Trucks, Buses, Tractors and various industrial applications. A bearing is a machine element that constrains relative motion between moving parts to only the desired motion. - Provide for free linear movement. HCL meets the demand of moulded and random woven clutch facings for all Indian and most international vehicles including passenger cars and light commercial vehicles. These are manufactured in state-of-the-art manufacturing facility with technology acquired from Bendix Mintex Pty Ltd., Australia. Our customers can avail from us, asbestos and asbestos free Clutch Facings that are available in molded and woven compositions. 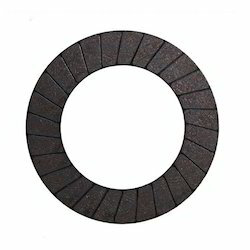 Our range of Clutch Facings possess excellent modules of elasticity and is demanded because of the features like stability and burst strength. We are mainly looking for export queries. 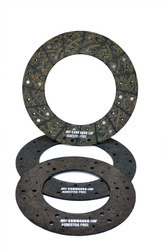 We are one of the leading manufacturers and exporters of Clutch Facing. Manufactured using quality material, these are widely used in Automobile Engineering and various other industries.